CROCS in the Northern Territory aren't rare - but they are at this size. 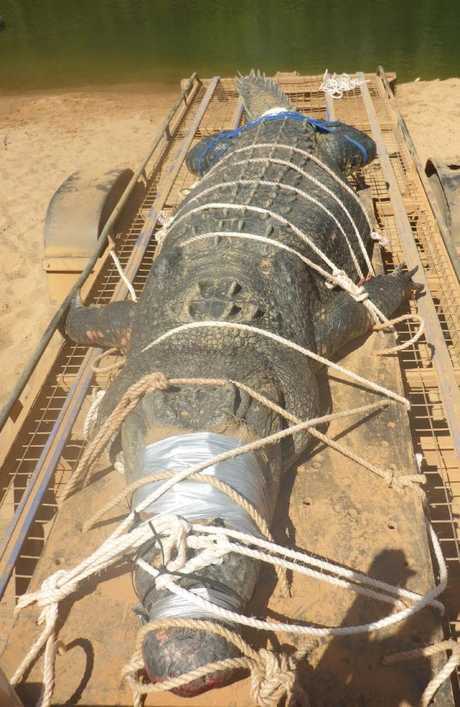 After a decade-long hunt, rangers in the Northern Territory have finally captured Katherine River's biggest croc - weighing in at a whopping 600 kilograms and measuring 4.71 metres long, about the length of an average family car. The hunt began after rumours of a "large dark tail" spotted near a local boat ramp, the Sydney Morning Herald reported. "We average a 4.2 metre croc most years, but never this big," Mr Burke said. "When they are this big we just sedate them, so there is no chance of us getting chomped," Mr Heydon told the SMH. "Although this is the biggest we've caught in the Katherine River, there are bigger ones out there that come up from the Daly River," ranger Burke said. The NT Parks and Wildlife are reminding the community to "be crocwise". On their website they make it clear that "croc danger is real". "Do not become complacent or risk your life." 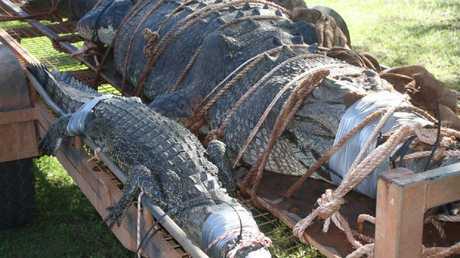 Croc captures are not unusual in the Top End, earlier this year seven crocodiles were pulled from the river, including two large saltwater crocs - 3.92 metres and 3.97 metres. There was even a larger find in Darwin, when rangers were called to capture a 4.7m croc from the city's harbour. Hope Inlet, located in the territory's northwest, has had the most croc captures this year at 42.